Each year, more than 14.5 million Americans become cancer survivors. Many local service providers are working to increase those survival rates by encouraging regular screenings. 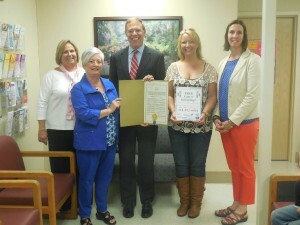 Assemblyman Barclay recently presented an Assembly Resolution acknowledging Cancer Survivor’s Day at the Oswego County Opportunities Cancer Services office. Pictured from left are Senior Director of Health and Nutrition Services Ellen Holst, Cancer Services Program Assistant Jeanne Farrell, Assemblyman Barclay, Coordinator of Cancer Services Carolyn Handville, and Coordinator of Administrative Operations Inga Back. Cervical cancer rates have been reduced dramatically since the Pap test was first introduced 65 years ago and 90% of cervical cancer can be cured if treated early. Despite these success rates, every two minutes, a woman will die of cervical cancer somewhere in the world. Breast cancer is the second most common cancer in women after skin cancer, but more than 1 in 5 women are not up to date with their mammography screenings. If everyone over the age of 50 had regular colorectal screening tests, at least 60% of deaths from this type of cancer could be avoided. Unfortunately, more than 30% of New Yorkers are not up to date with colorectal cancer screening. I sponsored a resolution in the Assembly urging the Governor to declare June 7 as Cancer Survivor’s Day in New York. In honor of this day, I was able to visit the Oswego County Opportunities’ Cancer Services facilities in Fulton and learn more about their local services. I also presented them with a copy of the Assembly Resolution and thanked them for the important outreach work they and other Cancer Service Programs do throughout the state. Many credit these programs with saving their lives and I am grateful they still receive state funds to continue this important work. Without the early screening, cancer can become more advanced, and cancer treatment, as many of you know, is emotionally taxing and a financial hardship. I want to draw attention to these services this week and let residents in Oswego, Onondaga and Jefferson counties know there is help out there if you do not have health insurance or face a high deductible. Cancer Services are free for the uninsured and underinsured. Free breast, cervical, and colorectal screenings are available for women ages 40-64 and men ages 50-64. There are no income guidelines for breast or cervical cancer screenings. There are many who have already been helped by this statewide screening program. Most counties have cancer services that help coordinate and promote the cancer prevention and other related services. Their work is largely funded through the State Department of Health. If there is a positive diagnosis, those in need of treatment may be eligible for insurance coverage through the Medicaid Cancer Treatment Program, which is aided by federal dollars. Cancer screenings are held regularly on the second and fourth Thursdays at the Fulton Medical Imaging office at Occupational Health at 510 S. Fourth St., Fulton, from 1 to 4 p.m. The next screening at the Fulton site is on June 25. Screenings are also held regularly on the second Wednesday of every month at the Oswego Hospital, 110 W. Sixth St., Oswego, Suite 180, with the next one set to take place July 8. To schedule an appointment, at the Oswego County locations, call Carolyn Handville at 315-592-0830. Residents may also be screened at their own provider’s offices but should call Cancer Services advance. Jefferson and Lewis county residents may call the Cancer Services program at 315-376-5453 to make an appointment to be screened at their own doctor’s office. In Onondaga County, residents may call 315-435-3653. All offices can reimburse the patient’s doctor directly but residents need to call to register first to be covered by the Cancer Services Program. My office can be reached by mail at 200 N. Second St., Fulton, New York 13069, by e-mail at [email protected] or by calling (315) 598-5185.